Get organized as soon as you step foot in the door. 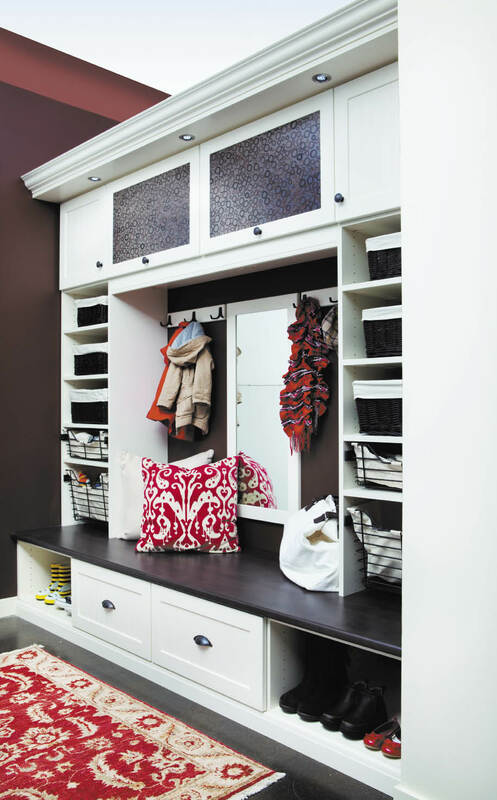 Shown here: A white entryway mudroom with chocolate and bamboo Ecoresin from California Closets. Contain the mess of files, and hobby supplies in a dedicated area. 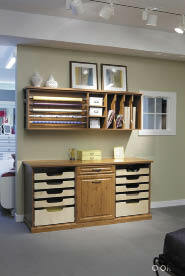 Shown here: A craft and wrapping station in a knotty timber wood grain finish from ORG. Photo courtesy of Alaska Premier Closets. 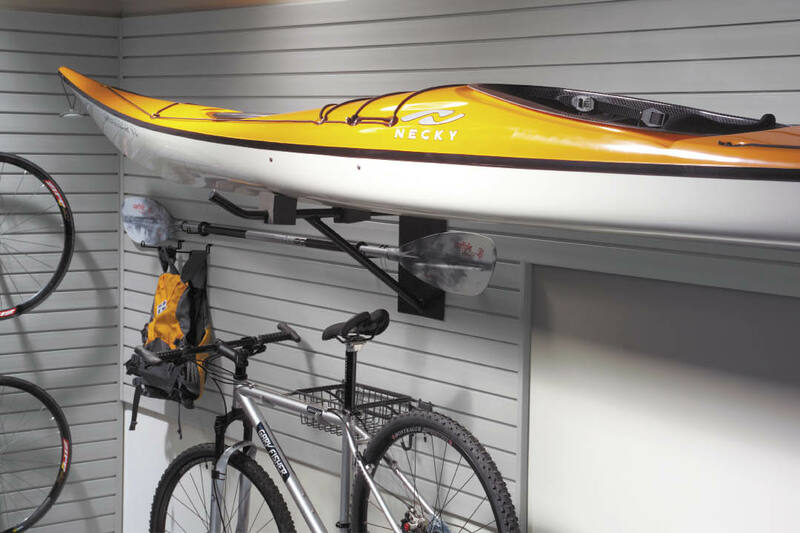 This storeWALL heavy duty storage solution helps get things off the floor and on the wall. Photo courtesy of Alaska Premier Closets. Photo courtesy of Alaska Premier Closets. An organized home is a happy home. You already know that seeing neat stacks of folded sweaters, or wrenches arranged by size, can bring a sense of peace and satisfaction to a person. But despite the best intentions to be tidy, life keeps on happening – mail piles up on the breakfast bar, clean laundry is stuffed hastily into closets, kids' toys get strewn all over the house – and before you know it you, and your home, are out of sorts. "There is a huge psychological component to organization," says Marge White, a designer (and former owner) at California Closets in Anchorage since 1985. "Having no control of your things is a big contributor to feeling depressed in your own house. " Organizing your stuff not only helps you find the camping gear in the garage or the muffin pan in the kitchen, it also can function as a way to restore order to your existence. Every major life change will almost always be accompanied by a re-organization of possessions – a marriage, a merging of households, a divorce, a new baby, a move, the kids leaving home, a death in the family. Cheryl Cummings, owner of The Closet Divas in Anchorage, says that she asks every client what they hope to gain from getting organized. "I think it helps them to really look at their situation and think about how they got where they are. This is especially true for my clients that are coming out of a traumatic or life-changing situation." If clutter doesn't bother you, then consider what the disarray can cost you. White points out that if you can't see it or find it, then you won't use it – and you might even replace that "lost" jar of cinnamon, or pair of sandals, or a USB drive, literally paying the price of messiness. Some people may begin to organize a space by removing the things they no longer want, but that method, says White, creates a negative experience of focusing on what you don't want instead of what you do want, which ultimately can defeat the purpose. "The best way to organize any space is to eliminate everything from that area and then put your favorite things back in," she explains. Once everything is removed, dust, wipe, vacuum or even paint so that you are left with a clean, blank space in which you'll want only your preferred, go-to items – the rest can probably go to a donation center. "If the entire home needs to be organized, the best place to start is in the bedroom," says Cummings. "This is an area where we should be able to escape to and rejuvenate and unclutter our thoughts. Just start in one space, complete that area and move on to the next." Both White and Cummings say that many of their clients have reported that seeing one space neatly ordered has motivated them to continue organizing entire homes. White says that elimination is one of two crucial steps in getting organized; the other step starts by looking up. "It's all about how you use your vertical space," says White. "Your vertical space is the most important way to get organized." Are you using the wall space over the tops of bookcases or bureaus? Could you add some shelving in your closet? What could you hang on the backs of doors? Might your family room benefit from built-in storage that goes all the way to the ceiling? When it comes to storing seasonal gear (and Alaskans have a lot), Cummings says this is where vertical space is really important. "Use as much vertical space as possible by hanging gear and equipment from the ceiling or walls," she suggests. "(This) will help to keep things off the floor, which is valuable real estate in any garage or shed." Out of wall and ceiling space? "Larger equipment can be mounted to the side of the house, garage or shed," she says. There's no reason to take up indoor space with ladders, garden hoses or snow tires. In the kitchen, one frustration that many can relate to is stowing – and matching up – those pesky storage containers and their lids. White stores hers with the lids on; yes, it takes up more space, but what you give up in cabinet room you gain in time, and, she says, you "probably need less containers than you think." Cummings recommends getting vertical again by using a wire-mesh magazine file for stashing lids on their sides. "Wire cubicles are one of my favorite organization solutions," says Cummings. "They are inexpensive and have many applications." Used in closets they keep handbags from sliding off the shelf, in kids' rooms they keep stuffed animals, toys and books neatly stowed and their uses are nearly unlimited in the garage. Plus, you can see through them so you'll know immediately where to find what you seek – whether power drill, teddy bear or wool cardigan. "Ultimately, getting rid of things is the only way to declutter," says Cummings. "Create good habits. Put your belongings away, right away, when you enter your home." Because possessions can grow over time but space will stay the same, consider employing a "one thing in, one thing out" policy, suggests White. For every new toy or piece of clothing brought home, donate an old one. Get on the phone lists of local charities who do periodic donation pick-ups – they come right to your door; plus, knowing they are coming is a great motivation for cleaning out your space. And, if you feel like giving up, don't – you can always seek the guidance of a professional to help lead you toward organizational Zen.